Every now and then I like to re-read an SF classic, and there are rarely safer hands to be in than those of Pohl and Kornbluth. I was surprised as I got into it that I couldn't remember a thing about this book - I suspect it's because despite featuring a number of 'adventure' scenes, it is so cerebral. And that is a limitation - but its one that reflects a daring and impressive piece of writing. Wolfbane starts with what seems to be a fairly straightforward 'rebel in a straight laced society of the future' storyline, with the 'What's in it for me?' main character Glenn Tropile getting in trouble in a society where everything is buttressed by ritual and formality - but that's just the beginning. We get an Earth that has been ripped away from the solar system, just about kept alive by the Moon, recreated as a sunlet every few years. 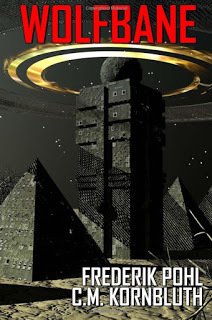 And we have some of the most enigmatic and alien aliens I've come across, pyramids that rarely move and that harvest people to use as components in their technology. There is drama here, when Tropile is threatened with death by having his spinal fluid drunk - and when the main characters are taken to the aliens' base and attempt to win back control of their world and lives - yet even that battle for survival has a strangely detached character, in part because, by now, some of those people have ceased to be truly human. So don't pick this book up if you want a page turner or beautifully crafted characterisation, but as a science fiction novel of ideas, despite its inevitably dated feel - the original version dates back to 1959 - it is up there with the best. Writer and SF enthusiast Edmund Crispin comments on the back that it combines 'Pohl's sensibility and Kornbluth's ruthlessness' - I'd say that Kornbluth had the upper hand if that's the case, as this one of the purest and most ruthless pieces of science fiction writing I've ever encountered..